Ethylcellulose is a cellulose ether commonly used for barrier membrane coating of multiparticulates for modified release applications. 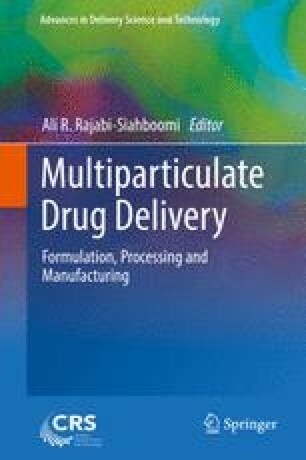 Various attributes of ethylcellulose polymer and formulation factors may influence drug release from multiparticulate systems. Degree of substitution and viscosity grade (molecular weight) of ethylcellulose and solvent systems used for the coating process affect the resulting film properties. The formulation factors such as choice and level of plasticizer, pore former, and particle size of the substrates affect drug release characteristics. Coating process conditions such as product temperature, air flow, spray properties, and humidity of the inlet air all individually or interactively affect properties of the barrier membrane film and, therefore, functionality of the coated multiparticulates. This chapter provides an insight into the use and applications of ethylcellulose in barrier membrane coatings of multiparticulates. ETHOCEL Ethylcellulose polymers technical handbook, Dow Cellulosic, Available at: http://www.dow.com/dowwolff/en/pdf/192-00818.pdf. Accessed May 2016. Surelease, Ethylcellulose Dispersion Type B NF, Product information. Available at: http://www.colorcon.com/literature/marketing/mr/Extended%20Release/Surelease/English/pi_surelease_prod_info_v3_2016.pdf. Accessed May 2016. Opadry EC. Ethylcellulose Organic Coating System, Colorcon, Inc. Available at: http://www.colorcon.com/literature/marketing/fc/Opadry%20EC/8523%20-%20Opadry%20EC%20Brochure%20V11%20web%20ready.pdf. Accessed on May 2016.